If you are interested in more discussion on the issue of controlling the corporations more which I raised in the last blog. Ralph takes the issue up as a space for the right and left to come together. At the bottom of the blog posting is a radio interview with Ralph. Ralph Nader has fought for over fifty years on behalf of American citizens against the reckless influence of corporations and their government patrons on our society. Now he ramps up the fight and makes a persuasive case that Americans are not powerless. 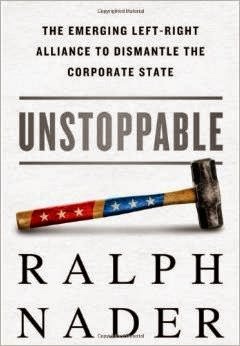 In Unstoppable, he explores the emerging political alignment of the Left and the Right against converging corporate-government tyranny. Large segments from the progressive, conservative, and libertarian political camps find themselves aligned in opposition to the destruction of civil liberties, the economically draining corporate welfare state, the relentless perpetuation of America’s wars, sovereignty-shredding trade agreements, and the unpunished crimes of Wall Street against Main Street. Nader shows how Left-Right coalitions can prevail over the corporate state and crony capitalism. He draws on his extensive experience working with grassroots organizations in Washington and reveals the many surprising victories by united progressive and conservative forces. As a participator in, and keen observer of, these budding alliances, he breaks new ground in showing how such coalitions can overcome specific obstacles that divide them, and how they can expand their power on Capitol Hill, in the courts, and in the decisive arena of public opinion. Americans can reclaim their right to consume safe foods and drugs, live in healthy environments, receive fair rewards for their work, resist empire, regain control of taxpayer assets, strengthen investor rights, and make bureaucrats more efficient and accountable. Nader argues it is in the interest of citizens of different political labels to join in the struggle against the corporate state that will, if left unchecked, ruin the Republic, override our constitution, and shred the basic rights of the American people.